When most people go to the grocery store to shop for their food, they don’t often think about the story behind their purchase. A bag of apples is just that and other than choosing the preferred variety, there’s not too much more thought that goes into it. We are very different when we go to the store to shop for our food. Working in the culinary world and being a lifelong home cook, knowing where our food comes from is one of the most important things to us. The choices we make at the grocery store and the dishes we choose to eat while dining out are often based on who raised or grew the product and how it was handled in the process. It matters to us and we know that those ingredients grown and raised with care just taste better. When I was asked to work with the SweeTango folks to help promote their new variety of apple, I was curious about more than how the apple was developed. I wanted to chat with one of the farmers who grows the SweeTango apple and get their perspective on growing a managed variety apple. The SweeTango apple is grown in five states in the U.S. (Washington, Minnesota, Wisconsin, Michigan, and New York) and in two Canadian provinces (Quebec and Nova Scotia) by a cooperative of 45 members, called the Next Big Thing. 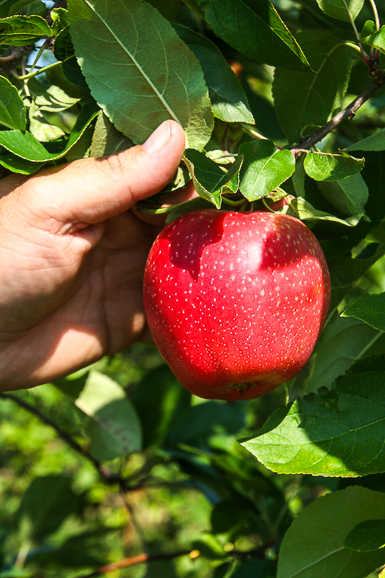 First introduced in 2009, this apple was developed by apple breeders at the University of Minnesota. They used natural methods to cross two varieties, the Honeycrisp and Zestar!, which resulted in the development of the apple tree that produces SweeTango, the Minneiska cultivar. 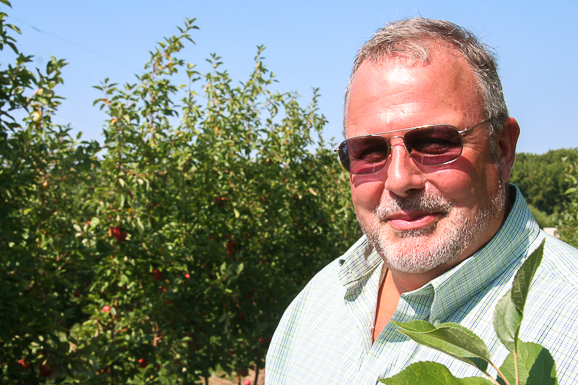 One of the SweeTango apple growers, Rod Farrow, owner of Lamont Fruit Farm in Waterport, New York, was kind enough to take some time out from his busy harvest season to answer some of our questions about growing the SweeTango apple. Lamont Fruit Farm was Incorporated in 1966 by sixth generation farmers in Albion, New York, brothers George and Roger Lamont. Farrow came over from England to work for the Lamont brothers in 1980 to learn about fruit production as their protégé. He returned to England after a period of time, but came back in 1986 to work for Lamont again. Farrow eventually began to buy in to the farm as a partner and today, he and his wife, Karyn, are the owners of Lamont Fruit Farm. They grow 27 varieties of apples on 480 acres of land, of which 28 acres are SweeTango and apples are the only thing grown on their farm. This year they will produce over 400,000 bushels of apples, of which 10,000 bushels will be SweeTango. Since SweeTango is a cultivated and managed variety, we were interested in understanding why a farmer would choose to to grow this particular apple. There is a substantial financial commitment and investment for the farmer as well as additional work that goes into successfully developing and growing a new variety. Rod Farrow answered some of these questions for us. I live for the apple pie. It’s so simple, so basic, but when done right, there is nothing that is more soul-satisfying. And when people have my apple pie, they purr. I have liked Sweet Tango on Facebook. I’ve been reading a lot about SweeTango apples lately and am on the lookout for them! The idea of maintaining consistency and quality through managed cooperatives is an interesting concept. I visited Idaho for the potato harvest and learned about the time and expense that goes into introducing new varieties – I wonder if they have managed varieties. 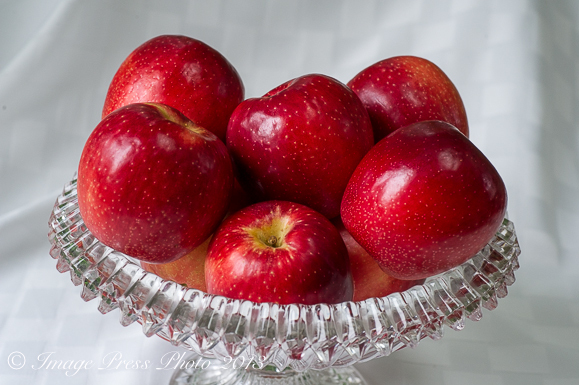 Thanks for this informative post – I like apples just as they are (if they’re good ones!) sweet and crispy in salads or with cheese. I am now following Sweet Tango on Twitter. I like you on Facebook, dear Bunkycooks. I can’t win this, obviously, but I am so with you on this. Last time I was in an American supermarket I noticed a sign in the produce section listing the fruits and vegetables that were sprayed or coated with wax. Apples. This scared me! In France, we buy apples from the apple people – they only sell apples and pears from the orchards. Real fruit. And what a difference! Wonderful interview, Gwen, and cheers to the Sweetango people! Julia child’s tarte tatin…a challenge but such a treat! I am a fool for apple crisp! The sweet and tangy apple paired with the nuts, brown sugar and oats in the crisp is divine! Nice story! I actually saw these at Manhasset Whole Foods last week, but didn’t buy because I wasn’t familiar. Now I am, so will definitely check them out. Thanks for the giveaway opp, too. I’ve liked SweeTango, and of course already like Bunkycooks all-around 🙂 – ! I Like @SweeTango on Facebook. I liked SweeTango on Facebook. Thanks! I liked Bunkycooks on Facebook. Thank you! My son graduated from the Univ. of Minn. He told me about Sweet Tango, and I have been enjoying them ever since. I just like to eat them raw. They are the best apple I have ever eaten. I love apple crunchie (or crisp as some may call it) It is the perfect combination of crunchy oats and delicious tart apples. I have never tried them with sweetangos, but having eaten them separately I can say that they would make a fantastic contribution to the cause. I liked @sweetango on facebook. Thanks! I liked bunnycooks on facebook. Thanks again! I followed SweeTango on Twitter. And bought a dozen yesterday! I liked SweeTango on Facebook.